Whether it’s for a single or combination putt, Hole In One International hands over the dough when your putting contest has a winner. Check out some of our recent putting contest coverage beneficiaries. Inver Grove Heighs, Minn – You know the old adage ‘drive show, putt for dough’, right? Well, for putting contest winner Paul Shadle, a pilot from Rosemount, nailing not one, but 3 impressive putts landed him a South Bay pontoon boat (valued at approximately $75,000) courtesy of Nelson Marine, plus $25K in cash, to assist with taxes, during the 2018 Venture Bank Minnesota Golf Show. The $100K Pontoon Putt, a fixture of the Minnesota Golf show, is not only a popular part of the show, it’s a fundraiser for First Tee. To qualify as a potential finalist for the Pontoon Putt Contest, attendees needed to first stop by the 1500 ESPN Tent during the first two and half days of the show and make a $5 donation for three chances to make a qualifying putt. Then, on Sunday, all the qualifiers returned for a “putt off”, to further narrow the field. Shadle successfully holed his second putt on the initial qualifier, going on to win Sunday’s putt off, making him this year’s lucky finalist who got the chance to make a 120-foot putt for the grand prize. And what it putt it was! Shadle’s winning shot was not only covered by the local media and CBS Sports, he was featured on the Golf Channel’s Morning Drive. What’s more, the big prize putt contest raised $4K for First Tee. Are you looking for a way to make your sponsorship dollars work harder and smarter – off the golf course? Need fresh ideas for your next fundraiser? Want to add the thrill of big prizes to your next special event? Looking to have a putting contest winner of your own? Hole In One International’s sister company, Odds On Promotions, can help. To learn more, email or give Odds On Promotions a call today at 1-888-827-2249. 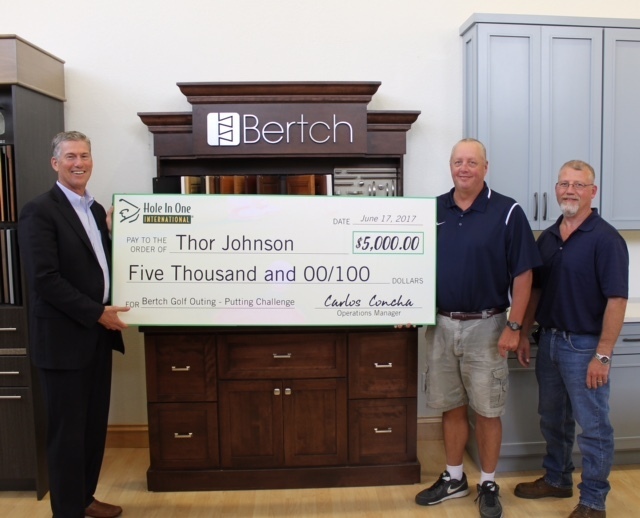 Waterloo, Iowa – Congratulations to putting contest winner Thor Johnson who won $5,000 this June, courtesy of LMC Insurance & Risk Management, and paid for by Hole In One International during the Bertch Cabinet Golf Tournament. Johnson won the big cash reward after he successfully holed a single 50-foot putt which took place on the practice putting green at the Fox Ridge Golf Course. The tournament, which has been running for many years, is an appreciation event for staff. Want to reward your team with the chance to putt for an amazing prize? Hole In One International can help! For more information, visit our website or give us a call today at 800-827-2249. We hope you end up having a putting contest winner of your own that we can feature on our blog in the future! Peoria, Ariz. – Congratulations to Mark Hamer, who won $30,000 in May, courtesy of the Peoria Chamber of Commerce, and paid for by Hole In One International. Hamer won the big cash reward after he successfully holed a 10, 30 and 50-foot combination putt during the Peoria Chamber’s $10 Million Dollar Shootout Golf Classic which took place at the Trilogy Golf Club at Vistancia. While this was the first year the Chamber offered the giant-prize putting contest, tournament organizers are no strangers to insured prizes. This tournament, which is the primary fundraiser supporting Peoria Chamber’s business and community programs, also features a golf shoot-out where ten randomly selected golfers get a chance to shoot for $1 million dollars from a special tee set on the 18th fairway. Want to give everyone who plays in your next golf event the chance to putt for an amazing prize? Hole In One International can help! For more information on creating a putting promotion that will help you sell more sponsorships, showcase your brand, or raise more money for your cause, visit our website or give us a call today at 800-827-2249. Whether you’re looking for hole in one insurance, a million dollar shootout, a single-putt putting contest, or a combination putting contest such as this one, Hole In One International has a golf contest for you!